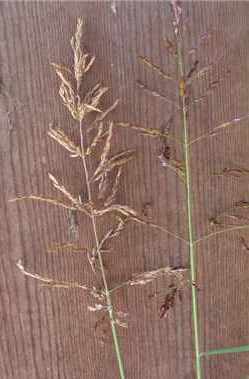 Coarse perennial grass to 2m high growing from long, thick, well developed creeping rhizomes, it can spread rapidly onto cultivated lands. Sorghum halepense tends to be difficult to control and can cause problems as it can cross-pollinate with other sorghums, causing seed contamination. Moist habitats, sub-tropics and Mediterranean climatic zones. It is often found on agricultural land, roadsides, disturbed and wet areas, railway easements and canal banks. Slender plant with numerous erect stems up to 2m high and 3-9mm thick. 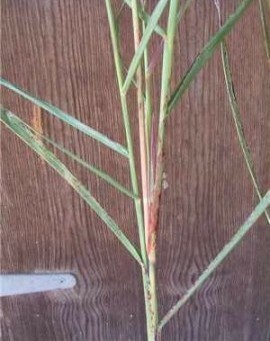 The leaf sheaths are essentially glabrous (hairless) and ribbed. The leaves are narrow, alternate, simple, smooth and are 30-60cm long and 2cm wide, with a prominent white midvein and hairs at the base of the upper surface, otherwise the leaves remain smooth and hairless. At the base of the leaf blade is also a prominent membranous ligule that is 1-3mm long with hairs to 2mm long. Slender plant, with numerous erect stems up to 2m high, arising from extensive, purple-spotted scaly, creeping rhizomes. Leaf sheaths glabrous (without hairs or scales). Pale green to purplish, many branched inflorescence. 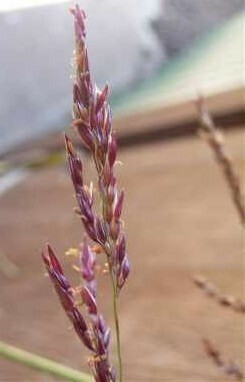 Spikelets in pairs along or in triplets at the end of panicle branches. Sorghum halepense can be differentiated from Sorghum leiocladum (wild sorghum) in that Sorghum leiocladum has nodes (bump on stem) that are bearded with long hairs and hairy leaf sheaths.